With a venue like the Brooklyn Grange Rooftop Farm, inspiration and possibilities for this intimate event were endless. Rustic, garden, bright and fun were pretty much my only instructions from a very busy soon-to-be NYU Graduate. Needless to say, it was an absolute pleasure to organise. Upon arrival, bushels of carrots guided the guests up to the Rooftop and the spectacular skyline views of Manhattan. The guest of honour's favourite cocktail, margaritas, welcomed the guests to the party, along with the delicious canapés by Fig & Pig Catering. After watching the sunset, guests enjoyed a relaxed, family style menu of beet and fennel salad, vegetable risotto, grilled skirt steak, roasted market fish, spring greens and crispy potatoes. 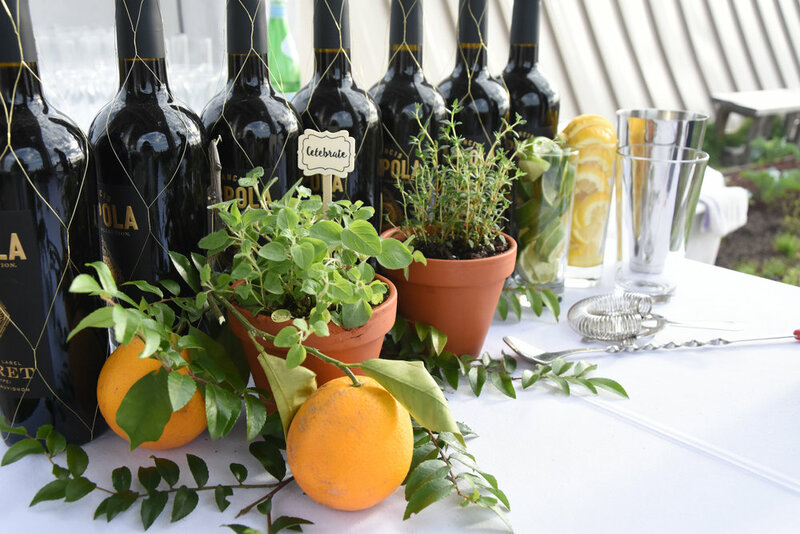 The 36 guests were seated together on one long table adorned with potted herbs, tomatoes, artichokes and lemons. Along with the gorgeous stationery by Emily Robertson of placement cards and menus, guests also received a personalised NYU (looking) diploma, my personal favourite being "Masters in Expensive Taste". The highlight of the evening was a very heavy, surprise gift offered by all of the guests to the guest of honour: a 40kg/90lbs Parmesan cheese wheel. This was then lifted (by about 4 guests) onto the dessert buffet to accompany the wonderful chocolate cake, pots of Eton mess, and enormous fruit and cheese board. Guests then relaxed in the rustic lounge, and danced and celebrated until the early hours. See more photos of this rustic Garden Chic event at the Brooklyn Grange Rooftop Farm in the Gallery here.